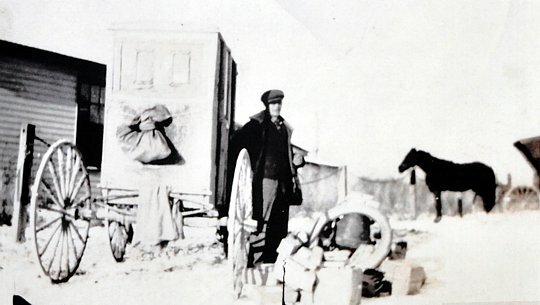 Fred Struben, Sr. carried mail with this horse drawn buggy in the 1920's and 1930's on his 32 mile mail route in Nebraska, Indiana. Fred kept a second horse at Denver Baldwin's home in Zenas, Indiana so he could switch horses along the way. During the winter months, Fred used a foot warmer and wore three layers of clothing to keep warm. He tied a feed bag to the back of the buggy for the horse. The photo below shows Fred sorting packages to be delivered on Christmas Day in 1925. The Jennings County Historical Society would like to sincerely thank Joyce Struben and her family for donating Fred Struben, Sr's 1920's mail buggy to the museum. 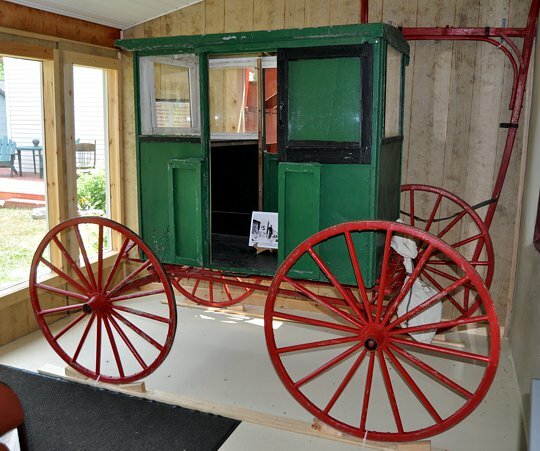 Joyce's late husband, Fred Struben, Jr. wanted the buggy displayed in a place where others could enjoy it. The Society would also like to recognize the donations of the following that made the enclosure possible: FPBH, Woodall Home Improvements & Roofing, Tree City Sheet Metal, Joyce Struben, Richard Artis, Mel Rudicel and Watts Electric.